"Sampath Speaking" - the thoughts of an Insurer from Thiruvallikkeni: KXIP successfully chase 206 .... Dale stained... !! KXIP successfully chase 206 .... Dale stained... !! 4-0-65-1 ……… 4-0-51-0 …. IPL is quite entertaining….the match between SRH & KXIP explored all probabilities of changing fortune ….. a bowler who has been so good in the tournament thus far went for 65 runs becoming the 2nd highest run giver in a match in IPL… imagine who is the 1st … and another feared to be World’s top was smashed around for 51.. thankfully, both were not in the same team. A report in TOI stated that the Proteas pacer is currently doing a course in photography from the University of Cape Town – and Steyn is quoted as saying that “It's difficult to juggle between photography and cricket”. He added that -India is such a vibrant and colourful country that it offers a lot of opportunities. The fiery pacer would have felt about his bowling on a rare occasion. The man who bowls his heart out has joined hands with the SAB (South African Breweries) to spread the message about scarcity of water and protecting the natural resource for the future. In that match at Rajiv Gandhi International Stadium, there was no scarcity for entertainment, as it rained fours and sixers – a total of 416 runs by two teams in 38.4 overs……… there were to be some unlikely heroes too -two wicketkeeper batsmen grabbed the spotlight and man of the match Wriddhiman Saha upstaged Naman Ojha. First the heroics of Naman Ojha (79 off 36) balls from Naman Ojha powered the Sunrisers to more than a challenging total. Shikhar Dhawan, scored a brisk 45 off 37 balls, David Warner chipped in with 44 off just 23 balls. Naman Ojha hammered four oundaries and an incredible seven sixes. Sandeep Sharma went for 65 runs. Kings XI lost opener Virender Sehwag (4) early, opener Manan Vohra (47) and wicketkeeper-batsman Wriddhiman Saha (54) who was all along considered a man who can accumulate but cannot amass had 91-run partnership for the second wicket in only 41 deliveries at a run rate of 13.31. Saha was a revelation making 8 fours and 2 sixers (of Dale Steyn) in just 26 balls, earning the man of the match. The unstoppable Glenn Maxwell made 43 off 22 ~ and when the scores looked challenging came that Dale Steyn over. 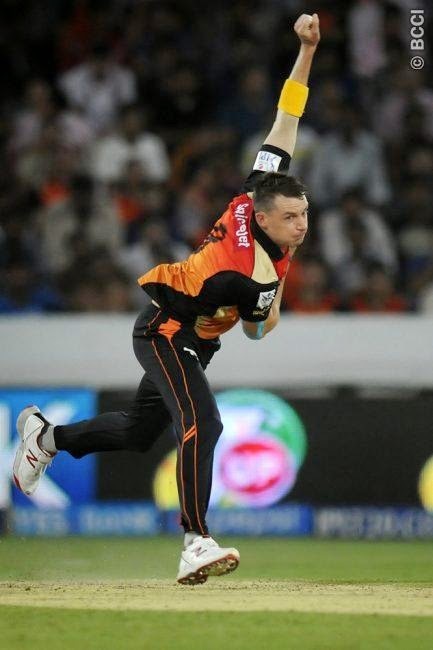 Bailey had not exactly excelled till that stage but exploded hitting out Dale Steyn for 22 runs and closing the match in the next over with more than an over to spare. An incredible finish indeed. Sandeep Sharma’s figure read :4-0-65-1 matching Umesh Yadav against RCB in May 2013 and one less than Ishant Sharma in the match against CSK in May 2013; Dale Steyn had figures 4-0-51-0 and dented ego….